Hummingbird Sundial Birdbath - Copper Verdigris. 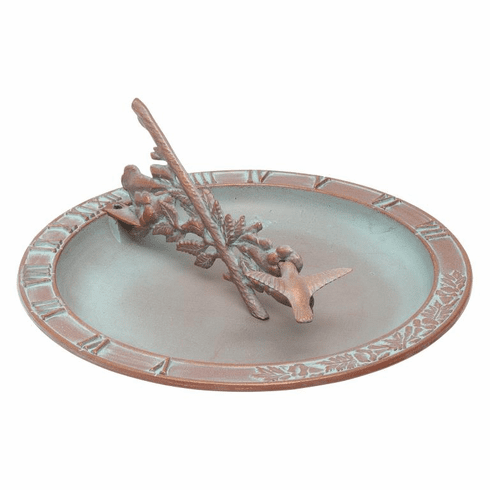 Combine the beauty and history of sundials with the relaxing hobby of bird watching with the Hummingbird Sundial Birdbath. Makes a great first impression, enhancing the curb appeal and value of your home. Fully functional sundial casts a shadow on the dial to reveal the time of day. Birdbath bowl allows you to enjoy the benefits of bird watching. Makes a great gift. Manufactured from die cast, high-density aluminum alloy. All Weather Coating and Aluminum shield coating -protect against the harshest weather and environmental elements. Extends the product life and maintains the look and function.